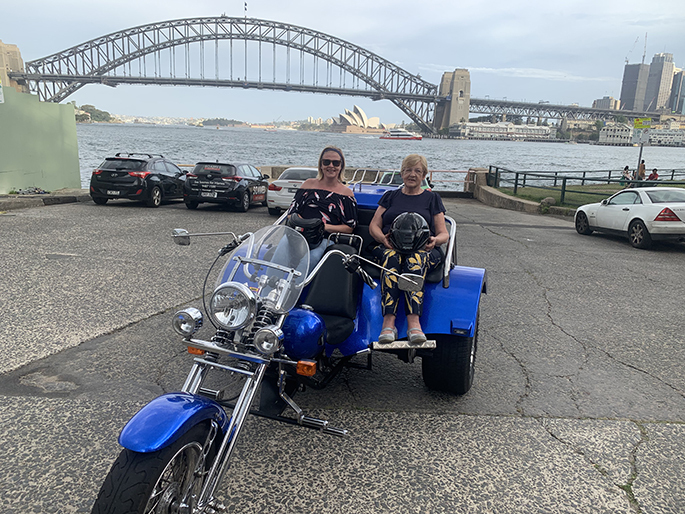 A New Year Cruising around Sydney tour was definitely an experience our passengers wanted to do. 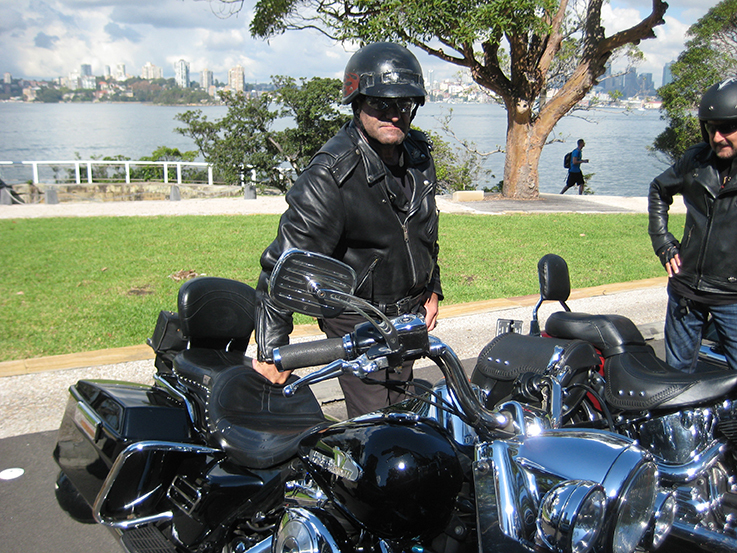 They met Steve at Circular Quay and he rode them around on the tour. The first bridge was the iconic Sydney Harbour Bridge. In our 12 years of doing tours, we never tire of seeing the arch from below. 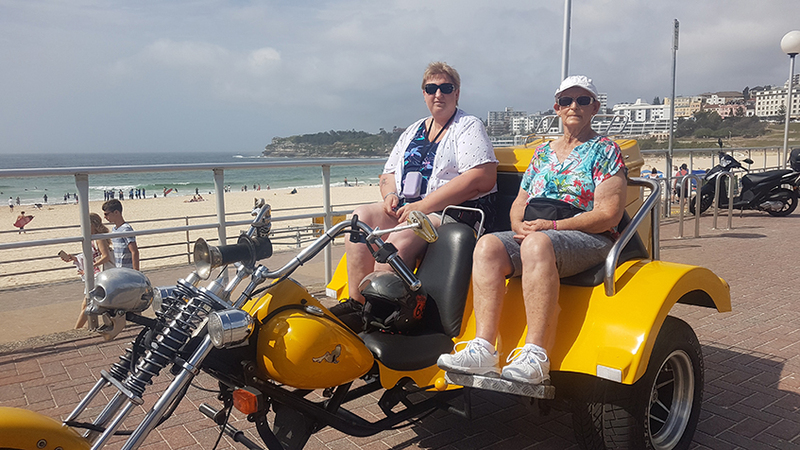 It is a great view from the trikes and Harleys as there is no roof to stop the view. First stop was Blues Point with the gorgeous view across Sydney Harbour towards the Sydney Opera House and the Harbour Bridge. They continued on into the lower north shore suburbs which led them to the inner western suburbs. There they rode over the second major bridge, the Gladesville Bridge. It has wonderful views along the Parramatta River to the Harbour Bridge. It is good seeing the city and the Harbour Bridge from a different perspective. The Gladesville Bridge leads onto the main arterial road, Victoria Road. They travelled on it for a short time before turning off into the suburbs of Drummoyne and Leichhardt where they followed the Bay Run. It is a 7 km walkway used by walkers, joggers, dog walkers and bicycles. It follows around Iron Cove which is part of the Parramatta River. Then onto the third bridge the fabulous ANZAC Bridge. The bridge was given its current name on Remembrance Day in 1998 to honour the memory of the soldiers of the Australian and New Zealand Army Corps (known as Anzacs) who served in WW1. An Australian Flag flies atop the eastern pylon and a New Zealand Flag flies atop the western pylon. Each of the bridges has an interesting history and each is constructed very differently so the trike tour of 3 bridges is a good ride to do. Also, each bridge has beautiful views from it. New Year Cruising around Sydney – well, actually any time of the year is a really fun experience.